DICOM (Digital Imaging and Communications in Medicine) is standard for storing and transmitting medical images enabling the integration of medical imaging devices such as scanners, servers, workstations, printers, network hardware, and picture archiving and communication systems (PACS) from multiple manufacturers. It has been widely adopted by hospitals, and is making inroads into smaller applications like dentists’ and doctors’ offices. Dynamically extracting, editing and showing multidisciplinary knowledge on every anatomical structure or pathology displayed in DICOM-images was the main goal of our online web-based DICOM tool. This direct integration between different online resources and the structure on the image can efficiently reduce time and effort needed for looking up any required information. While scrolling through the DICOM images, this tool allows learners to have full access to resources in our database or other external resources with a single click or a touch on a certain structure. Our DICOM-platform is built to simulate radiology learning. It is purely interactive and educative. One of its main features is the ability to annotate and link structures and pathologies in the DICOM-images directly with all possible knowledge resources on the web. Implementing the blockchain in this platform will For teaching the user is allowed to build his own files for further use or lecturing, and this is aided by many auto recognition features like recognizing the same anatomical structure in a whole series and link it with the appropriate knowledge resource. Other features like social networking between the users, lecture presentation mode, tablet and mobile device mode, multi-touch capability, online case discussion, quick note system, have been implemented in the Tool. The community of VoxelX is our real capital. We can divide this community according to the interest into learners, publishers and validators. All of them can interact with each other publicly or privately. Every VoxelX registered user will have a wallet created and linked to their account. Unlike traditional cryptocurrency wallets on the market, the VoxelX wallet will be linked with ranking system in the Platform, the more you contribute to the platform the more you get GRAY, the better you are ranked. 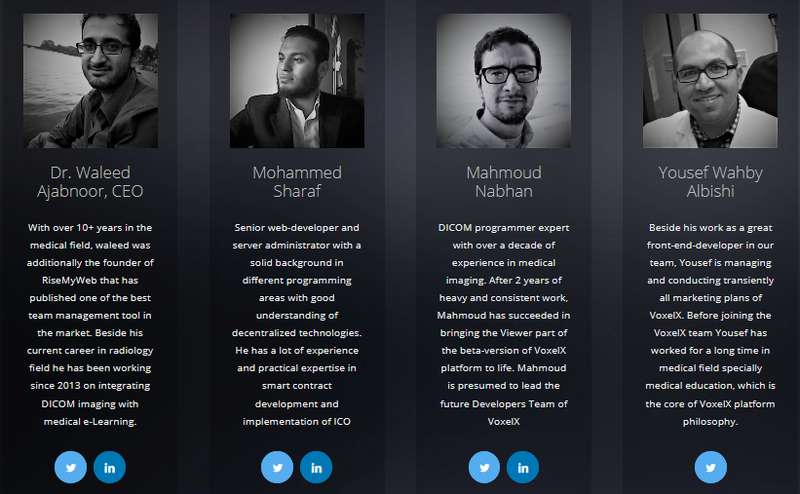 Publishers will access all properties of VoxelX, The DICOM Platform and GRAY Tokens. They will use the Platform to upload the DICOM images, store it and categorize it. The next step is to annotate and link the structures on the images with all possible knowledge resources on the web. They can also append their own referenced prevalidated knowledge to the uploaded case in the recall section. After reviewing the publishers can publish now their cases in different circles (Private, Friends , Public). For public circle the published material need be validated from the validators team. All mentioned steps above can be done by a single or multiple publishers. Every single step or even a single draw or annotation will be awarded with GRAY token after validation of the work. These earnings are subject to an award algorithm that will calculate the worth of every single act of the publisher. The main concepts or stages of VoxelX development from start to profit can be simply illustrated in the figure below. All these stages of development are however intercrossing at their sublevels. What is important to emphasize here is that the Blockchain has given us the bridge that will take us from development to profiting. The blockchain provide a wide-spectrum of capabilities and these has inspired us with dozens of new ideas that we have already implemented a part of it in our Beta platform and many other are on their way of production. With the help of Blockchain we have created an award system that encourage publishing using the GRAY coins to help building the content of the platform. GRAY coins are Ethereum’s ERC-20 tokens that enabled us to design rewards algorithm that pays radiologists for every single even tiny submission and update of the contents and images of the platform. With GRAY coins we are able to monetize the online content and create incentives to encourage radiologists both as publishers and validators in building and expanding the community of the platform. The choose of the name GRAY was not arbitrary. GRAY is referred to the gray unit that is used to measure the absorbed dose of ionizing radiation, which is defined in the 1980s by the International Commission on Radiation Units and Measurements and named after the physicist Louis Harold Gray. Gray unit is widely used in the medical field as a protection tool to measure scatter radiation from devices that use radioactive waves. 45% of GRAY tokens will be sold in the initial GRAY token sale. The token sale will be composed of a private pre-ICO round for strategic and early investors followed by a public offering. Tokens sold during the private and pre-ICO rounds will be discounted up to 20%. 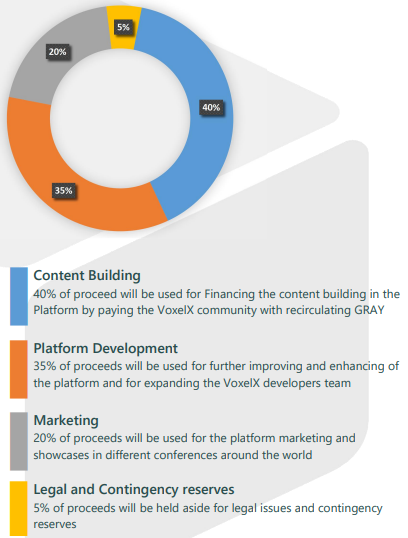 25% of GRAY tokens will be held by the VoxelX Foundation. These tokens will be used to finance and encourage the community of VoxelX to build the content of the platform through a rewards algorithm using the GRAY coins. 10% of GRAY tokens will be held by early investors and bonuses for large purchases. Most of these tokens will be subject to lockup restrictions and release over time. 20% of GRAY tokens will be retained by VoxelX and reserved for founders, team members. 20% of these tokens will be available after the initial offer with 20% being unlocked every 6 months thereafter.